If your searching for the most energy efficient TV types in 2018 or 2019, this post should help! Here we let you know the most energy efficient types of TVs and links to the ones that have the best reviews on Amazon. Reducing the amount of energy your TV uses is one of the best ways to save money on electricity. If you are looking for a new energy efficient flat screen TV but are wondering which ones use the lowest amount of electricity, this post should help you make a better choice. Plasma TVs (Energy Efficient): Plasma televisions have many benefits over other types of energy efficient TVs. Their price point and color range are 2 common reasons people choose Plama over LED or LCD. Although, Plasma TVs are known for having a shorter lifespan. If you are looking for an inexpensive energy efficient TV, a flat screen Plasma TV might be for you. If you are looking for a longer lifespan with a slightly higher price point, check energy efficient LCD TVs. LCD TVs (More Energy Efficient): LCD televisions have many benefits as well such as light weight design, increased contrast, sharper image resolution and large screen sizes. LCD TVs are known for having a longer lifespan than Plasma TVs. LCD TVs are available is a wide variety of screen sizes and can be anywhere from 13-70 inches. LCD TVs use less power than older TVs and Plasma TVs. This means that owners of one will notice a small energy savings on their electricity bill by upgrading to an LCD TV. 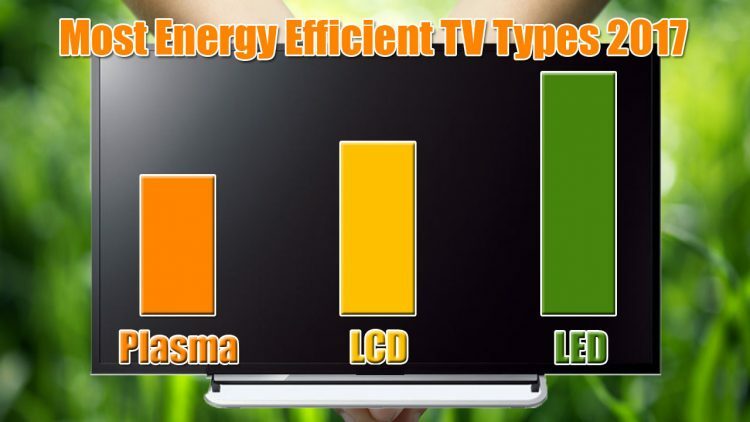 LED TVs (Most Energy Efficient): LED TVs use less power than LCD & Plasma TVs of the same size. LCD TVs can help you save as much as 30-70% more electricity than any other TV type. However, the price tag that comes with the savings is also slightly higher than the 2 other types. Although, your LCD TV will last longer and bring you a higher ROI overtime. LCD is the most energy efficient TV type in 2017. The cheapest and most energy efficient tv’s in 2018 are the Roku Smart TVs (2018 models). Not only are the the most energy efficient but they also come with a bunch of awesome features like additional apps you can add. You might even be able to catch a great price for Black Friday TV deals 2018. It can be tough to find the right energy efficient TV with so many options available. We did some research to find the highest reviewed energy efficient TVs in 2018.